(Lawrence, MA) – Notre Dame Cristo Rey High School students have ranked #1 out of 32 fully enrolled Cristo Rey Network high schools (11,522 students) in this year’s performance evaluation of the network’s Corporate Work Study Program (CWSP), a reputable standing that the school has earned 10 out of 12 times. NDCR students are making monumental impressions upon 75 work locations throughout Merrimack Valley, Route 93/128 corridors and Southern NH. Part of this achievement stems from having a well-founded training program roped in the fundamentals of workplace success. Incoming freshmen students are required to attend a two-week long summer training program consisting of over 40 workplace preparedness courses. Presentations ranging from business writing to workplace safety pave the way for students to thrive in an otherwise seemingly daunting Corporate America. Training began this week for the Class of 2022. At Notre Dame Cristo Rey, students are on track to higher education. 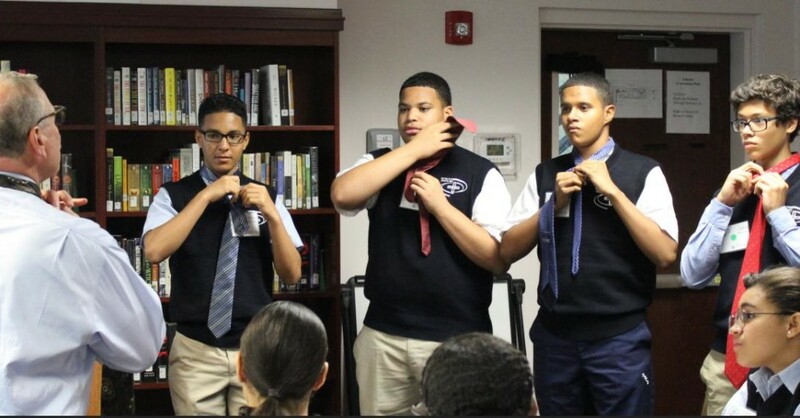 With a 100% college acceptance rate into four-year colleges and universities, and a college graduation rate of over 62% compared to a national average of 15% within its same demographic, the CWSP allows students the opportunity to receive a private, college prep education when they would not otherwise be able to afford it. The school transports all students to work one day a week so that they may earn 60% their tuition by working in entry-level office positions. After the high school raises funds for additional tuition assistance and financial aid, students and their families pay only 10% of the cost to attend the high school. As the statistics for the 2017-2018 school year affirm that Notre Dame Cristo Rey is on track with its mission, the work towards transforming another generation of student workers begins.